Fundraisers - Interact Event Productions - Corporate Event Planning at Wholesale Prices! A fundraiser is a campaign or an event that helps raise money for a cause. Fundraisers can be for a company, a group of people or individuals whose main aim is to raise funds for a specific non-profit organization or charity. If you need money, throwing a fundraiser is a great way to raise the extra money. It is not uncommon for individuals, groups and organizations to rely on funding that might be generated from this type of event. Although this is common there are services out there that will provide you with everything you need to throw a professional and profitable fundraiser at no cost to you. That's right, no cost to you. 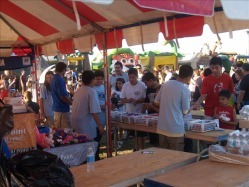 Build It Bash is a Fundraising Package Program from the experts at Interact Event Productions that allows individuals, groups and organizations to use all of their equipment, marketing materials, rides, booths and games for their fundraising use at no cost to them. The cost of renting rides, games and inflatables alone can cost thousands up front. 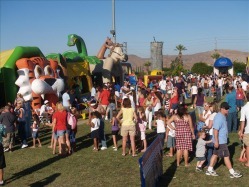 The Standard Build It Bash Fundraising package includes Inflatables, Hard Rides, Prize Booths, Ticket Booths, and Marketing Materials. This entire package is provided at no up front cost to you. After the fundraiser the proceeds will be split with Interact Event Productions 50/50. There are so many Bouncers, Playcenters, Obstacle Courses, and Hard Rides to choose from. Each Fundraiser is customized to your specifications. The Fitness & Olympic Fundraising package includes Interactive Competition Stations, Obstacle Courses, Hard Rides, Prize Booths, Ticket Booths, and Marketing Materials. This entire package is provided at no up front cost to you. After the fundraiser the proceeds will be split with Interact Event Productions 40/60. Our Fitness & Olympic Competition packages are a great way to get fit and raise money for your charity or organization. Perfect Indoors our outdoors you're sure to enjoy this healthy alternative to your ordinary fundraiser. 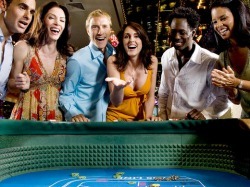 Our High Roller Casino Night Fundraising package includes Craps Tables, Roulette, Poker Tables, Horse Racing, Marketing Materials and more. Our Casino Event fundraiser has the look and feel of a real Las Vegas casino! This entire package is provided at no up front cost to you. After the fundraiser the proceeds will be split with Interact Event Productions 30/70.